Taylon Davis is a 12-year-old girl with an inoperable brain tumor who had a far-fetched wish. She wanted to dance with Beyoncé and, recently during the star's Las Vegas stop on the Mrs. Carter Show World Tour, that wish was granted. 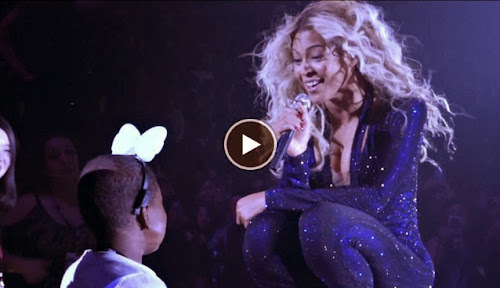 In an emotional video, above, Beyoncé swoops in, hugs the girl and smiles while an overwhelmed Taylon wipes away tears. Then, they duet a bit of "Love on Top" before Beyoncé sings "Survivor" to Taylon, who responds by dancing enthusiastically. Taylon's wish became a reality thanks to the Make-A-Wish Foundation, the organization that sent Taylon and her family to the Beyoncé concert. It also brought us Batkid, the 5-year-old boy battling Leukemia who became Batman for a day in November. "Here's a little girl literally fighting for her life," philanthropist Ivy McGregor says in the video. "Tomorrow's not promised, next week's not promised, but right now, 'I'm here.' And her thought that will forever stay with me is, 'Since I'm here, I might as well live.'"